Length 14 to 20 mm. This beautiful iridescent beetle can occur in a variety of colours; the wing cases or elytra are typically bright green, but they may be darker, variegated or golden. The white marks on the elytra are also highly variable between individuals. There is always a V shaped mark on the back where the wing cases meet. They feed on leaves, fruits, flowers and buds of a range of plants including roses, (hence the common name), and are often perceived as garden pests for this reason. 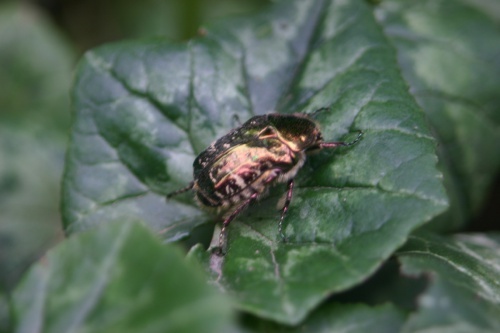 The adult beetles are active between April and September; they fly clumsily and are typically seen in sunny weather. The larvae live inside rotting wood and humus. Scattered records for this species across the southern half of Britain. Quite rare in Leicestershire and Rutland. There were only 5 VC55 records for this species up to March 2015.